Aqui hay algunos lugares para buscar informacion sobre Santiago Atitlan y sus habitantes . www.discosatitlan.com La disquera cooperativa propia de Santiago. 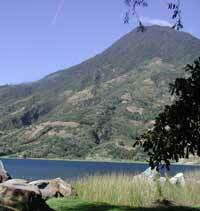 www.atitlan.com Un sitio bonito de Panajachel que tiene fotos y buena informacion comercial. www.nimpot.com Sitio excelente sobre Tejidos. Han comenzado un catalogo de la historia del traje de los diferentes pueblos por toda Guatemala. www.sigloxxi.com Prensa comercial de la ciudad de Guatemala. Tienen una version en Ingles. Carlsen, Robert. S. The War for the Heart and Soul of a Highland Maya Town. Austin. 1337. Carmack, Robert M. The Quiche Mayas of Utatlan. Norman. University of Oklahoma Press. 1 98 1. Carrasco, D. L. Religions of Mesoamerica. Harper San Francisco.1990. Clendinnen, Inga. Ambivalent Conquests. Cambridge. Cambridge University Press. 1987. Coe, Michael D. Breaking the Maya Code. London. Thames and Hudson. 1332. Coe, Michael D. Mexico. New York. Thames and Hudson. 1984. Coe, Michael D. The Maya.5th.ed. London. Thames and Hudson. 1993. Coe, Sophie D. & M. D. The True History of Chocolate. New York. Thames and Hudson. 1996. Dayley, Juan Felipe. Diccionario Tzutujil. Antigua, Guatemala P.L.F.M. 1996. Edmonson, Munro. The Book of Council~ The Popol Vuh. MARI Pub1.35. New Orleans: Tulane. 1971. Ehrenrich, Barbara. Blood Rites. New York. Holt and Company. 1997. Freidel, David; Schele, Linda; Parker, Joy. Maya Cosmos. New York. William Merrow. 1993. Graulich, Michel. Myths of Ancient Mexico. Norman. University of Oklahoma Press. 1997. Katz, Freidrich. Ancient American Civilizations. London. Weidfeld and Nicolson. 1985). Landa, Bishop Diego de. Landa´s relacion de las cosas de Yucatan. Edited by Alfred M. Tozzer. Papers of the Peabody Museum of American Archaeology and Ethnology, Harvard University, vol 18. Reprint . New York: Kraus Reprint Corp.
Lothrop, Samuel K. Atitlan: an archaeological study of ancient remains on the borders of Lake Atitlan, Guatemala. Carnegie Institution of Washington, Publication # 444. Washington, D.C.
Lovell, W. George. Conquest and Survival in Colonial Guatemala: A Historical Geography of the Cuchumatán Highlands, 1500-I821. Montreal and Kingston. McGill-Queen's University Press. 1992. Markman, Roberta and Peter. The Flayed God. New York. Harper Collins. 1994. O'Brien, Linda. "Songs of the Face of the Earth: Ancestor Songs of the Tzutuhil Maya of Santiago Atitlan,Guatemala." Ph.D; U,C,L.A, 1375. Orellana, Sandra L. Ethnohistory of the Pacific Coast. Lancaster, California. Labyrinthos. 1995. Orellana, Sandra. L. The Tz'utujil Mayas. Norman. University of Oklahoma Press. 1984. Nuestro maíz del Lago Atitlán / coordinador: Carlos Ochoa García. Guatemala: Casa de Estudios de los Pueblos del Lago Atitlán, 1998, Colección Xokomil, no.8). Historias de la noche en el Lago Atitlán / Andrés Chiyal ... [et al.] ; coordinador: Carlos Ochoa García. Guatemala: Casa de Estudios de los Pueblos del Lago Atitlán, 1999. Técnicas del Lago Atitlán. Tomo I : agricultura, pesca, construcción de canoas y medicina tradicional / coordinador: Carlos Ochoa García. Guatemala: Casa de Estudios de los Pueblos del LagoAtitlán, 1999, (Colección Xocomil, no.9). Técnicas del Lago Atitlán. Tomo II : construcción de casas / usos del maguey, del tule y de la caña brava / fabricación del jabón / apicultura / cacería . coordinador: Carlos Ochoa García. Guatemala: Casa de Estudios de los Pueblos del Lago Atitlán, 1999 (Colección Xocomil, no.10). Schele, Linda & Miller, Mary Ellen. The Blood of Kings. New York. George Braziller, Inc. 1386. Sharer, Robert J. The Ancient Maya. Stanford, California. Stanford University Press. 1994. Smith, Carol A. Guatemala Indians and the State: 1540 to 1388. Austin. University of Texas Press. 1994. Tarn, Nathaniel with Prechtel, M. K· Scandals in the House of Birds. New York. Marsilio Publishers. 1997. Tedlock, Dennis. Popol Vuh. New York. Simon & Schuster. 1985. Thompson, Eric J. Maya History and Religion. Norman. University of Oklahoma Press. 1970.